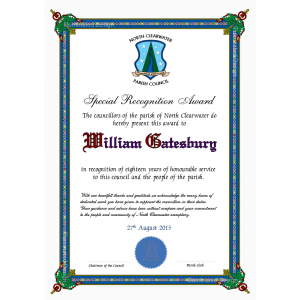 Presentations provides unique, high quality professional award certificates suitable for councils, businesses, societies, clubs, special occasions and many more. Our certicates are not mass produced or 'print from screen' items but individually produced using a variety of mediums and techniques. 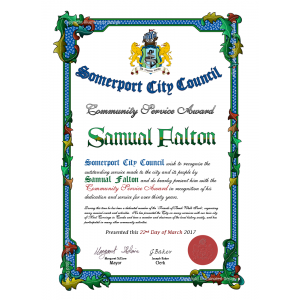 Our certificates and awards can just be printed for our most cost effective service but can include hand painting and raised gold leaf to produce stunning finished items. 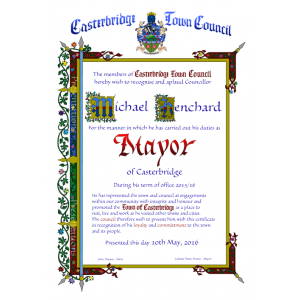 Our certificates and awards could be used for presentations such as 'Honorary Freeman' of a town or city, or to recognise the success in a term of office such as a Mayoral Year. Maybe you wish to present someone with recognition for a special occasion, such as a long service, or present a bravery award. 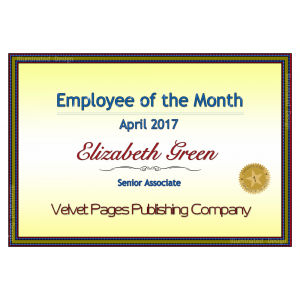 Or maybe you want to create a special anniversary certificate such as for a wedding, or birth or for the passing of a loved one. Presentations is happy to discuss with you about any of these and can work with you on a design and price that suites your particular need. 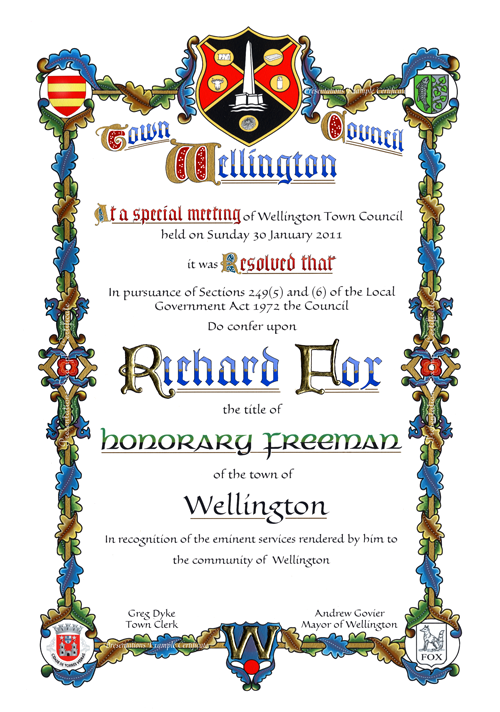 Presentation certificates are usually created to order so there is no need to select and pay for anything right away. First we will talk to you about what you need and what you are looking for in your certificate, award or other presentation item. We offer a variety of styles and options available and examples can be found in our Gallery of previously produced works or in the various section in the menu above. Please remember though that these are not a the only things we can produce. We can talk about any style and design you have in mind from the most traditional to something modern or jazzy. Designs can be very quick but it can take several days to get a design looking just right. Once we have discusses the requirements we will produce an initial layout for your consideration and then make alterations and adjustments until you feel you have the design that fits your purpose. It is at this point we will ask for payment from you. And aspects of the design that require more significant time input such major amendments, creating unique graphics, hand painting or adding raised gold leaf will require a firm order before we can proceed. Although we have many great designs ready to use it can take time to finalise a design and of course produce it afterwards. It is therefore important to give us much notice as you can before you need your certificate to allow us to both agree the design and schedule it into our work programme. Certificates can be created more quickly but this will involve giving our designers more scope to create the certificate on your behalf. Rush orders are of course possible if there is time but may require an additional charge. 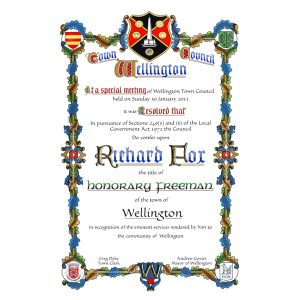 Our certificates, scrolls and other presentation items are easily customised to meet your requirements by adjusting sizes, colours, and materials used and we can include crests, emblems and other graphics to personalise every item we produce. Just click on the 'Contact Us' link below or the 'How To Make An Enquiry' link to start your enquiry.